This is my first needle felted creation (well actually third time lucky- 1st was done in the wrong wool and his hand fell off second was nearly there but ended up with sausage fingers :lol:) It could become another addiction! I have to give credit to the very talented Sara Renzulli http://www.sarafinafiberart.com/ as it is her fantastic tutorials that has shown me the way. I didn't even know what core wool was until I stumbled on her via Etsy. By the time I was on Graham I was already trying out my own little changes and seeing more possibilities. There is a lot to take in about different types of wool and needles but I am beginning to pick it up and like any thing it is trial and error. The other bonus is the more I learn the less I stab my fingers (boy it hurts :cry:) and break needles Be interested to know how others learnt how to needle felt? I absolutely love this mouse!! Thank you Becky, Thelma and Bridgitte! I Love it!!!!! Very well done, even his little feet are perfect. 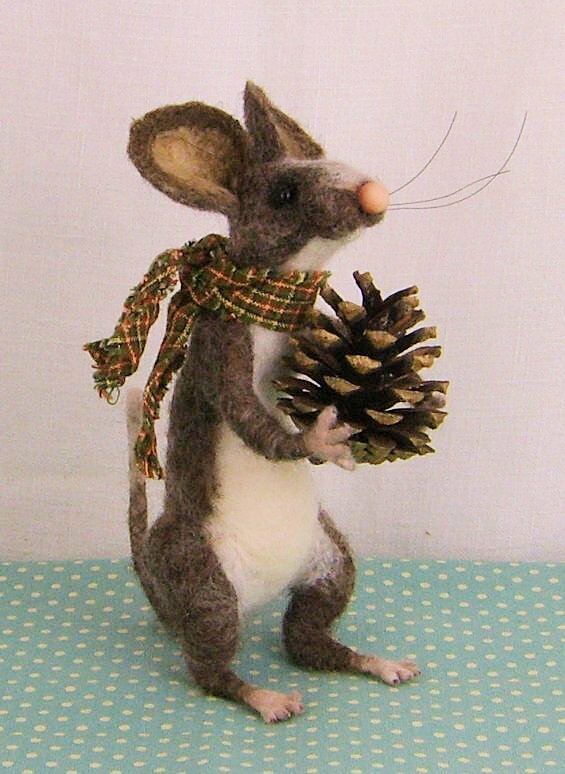 I am a huge rodent fan and want to make them myself, but haven't had the courage yet. Thank you Pink, Jen and Pauline Glad to know that I'm not the only one who breaks needles Pink! Jen go for it - if I can do it anybody can! Can't believe you're a beginner at this craft, Graham is so good,great detail. I've never got the hang of needlefelting so thanks for sharing the link,I'll study the tutorials and give it another go.